Read Emma Larkin's posts on the Penguin Blog. A deeply reported account of life inside Burma in the months following the disastrous Cyclone Nargis and an analysis of the brutal totalitarian regime that clings to power in the devastated nation. Emma Larkin, who has been traveling to and secretly reporting on Burma for years, managed to arrange for a tourist visa in those frenzied days and arrived hoping to help. It was impossible for anyone to gauge just how much devastation the cyclone had left in its wake; by all accounts, including the regime's, it was a catastrophe of epic proportions. In Everything Is Broken, Emma Larkin chronicles the chaotic days and months that followed the storm, revealing the secretive politics of Burma's military dictatorship and the bizarre combination of vicious military force, religion, and mysticism that defined its unthinkable response to this horrific event. The Burmese regime hid the full extent of the storm's devastation from the rest of the world, but the terrible consequences for Burma and its citizens continue to play out months after the headlines have faded from newspapers around the world. 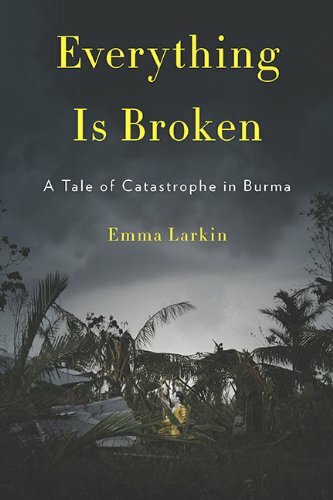 In Everything Is Broken, Larkin-whose deep knowledge of the Burmese people has afforded her unprecedented access and a rare understanding of life under Burmese oppression-provides a singular portrait of the regime responsible for compounding the tragedy and examines the historical, religious, and superstitious setting that created Burma's tenacious and brutal dictatorship. Writing under an assumed name, Larkin delivers the heretofore untold story of a disaster that stunned the world, unveiling as she does so the motivations of the impenetrable generals who govern this troubled nation. Emma Larkin is the pseudonym for an American journalist who was born and raised in Asia, studied the Burmese language at the School of Oriental and African Studies in London, and covers Asia widely in her journalism from her base in Bangkok. She has been visiting Burma for close to ten years. The soldiers are moving cautiously through the gardens of the ShwedagonPagoda. They walk in solemn groups of three. The trousers of their darkolive-green uniforms are rolled up around their knees and they are barefoot.They shuffle their feet methodically through the undergrowth, squelchingtheir toes into the mud and grass. Their heads are bowed in concentration,as if in prayer. The gardens they walk through are in ruins. Palm trees that used to standstraight and tall around manicured lawns are now bowed and broken.Other older and stiffer trees have been wrenched from the ground and liewith their tortured roots exposed above the churned-up soil. There is nolonger any semblance of the once lush gardens. The neatly trimmed shrubberyhas been ripped to shreds or flattened by fallen trees. The flower bushes havedisappeared entirely. But none of this concerns the soldiers as they fan outsilently across the gardens. Looming high above them is the Shwedagon Pagoda, an ancient andmassive bell-shaped structure encased in gold—the most sacred and potentBuddhist site in all the land. As the soldiers circle the base of this reveredgolden mountain, they wield long scythes and use bamboo sticks to rakethrough the tangled debris. Occasionally they hoist aside a damp log andblinded beetles scuttle out of their way. When they hack through splinteredbranches, dead leaves are scattered in their wake. One of the soldiers squats down suddenly, attracted by a flash of glimmeringred in the monotonous brown of soil and dying vegetation. The soldiersticks his fingers into the mud and lifts up a clump of earth. The others watchas he uses his thumb to swipe away the dirt and reveal a large, perfectly cut,bloodred gem—a Burmese ruby. Without saying a word, a higher-rankingsoldier holds open a drawstring sack. As soon as the ruby is placed inside, thesoldier ties a tight knot around the bag and slings it over his shoulder. It landsagainst his back with a soft jangling noise that seems to indicate it maycontain other precious stones salvaged from the gardens of the ShwedagonPagoda. The man who found the ruby gets up and wipes the dirt off his hands,allowing himself a secret, triumphant smile. And, together, the soldierswalk on. A few days after Cyclone Nargis made landfall at the southwestern tipof Burma’s Irrawaddy Delta on Friday, May 2, 2008, NASA releaseda set of before and after pictures taken by satellite. In the image taken before the cyclone, the delta’s myriad waterwayswere perfectly etched upon the landscape, like dark and delicate veins.Toward the lower edges of the delta, in the coastal stretches, these veinsbroadened and merged into the inky blue waters of the Andaman Sea.Large swaths of vibrant green indicated fertile rice-growing land. Deforestedareas and urban centers, like Rangoon and its surrounding sprawlof slums, showed up as dun-colored patches. In the delta, towns such asLaputta and Bogale were barely visible amid the pastoral palette of greens,browns, and blues. The satellite image taken shortly after the cyclone depicted a landscapethat had been changed dramatically. The fact that the area aroundRangoon was now a marbleized swirl of aquamarine suggested that itwas heavily flooded. The waterways of the delta, so distinct in the earlierimage, had become blurred and hazy. The blue of the Andaman watersshowed up as a luminescent turquoise color that had seeped onto theland, an indication that parts of the delta now lay underwater. Comparingthe two images it seemed as if a bucket of water had been sloshedacross an ink drawing; the carefully marked lines had been erased andthe paper beneath was buckled and distorted. These images showed that Cyclone Nargis had altered the landscapesignificantly and caused substantial damage. Yet, in those first days afterthe cyclone, hardly any news emerged from Burma. The storm severedphone lines and electrical wires, and it was almost impossible to get informationfrom inside the country. The cyclone had been brewing in the Bay of Bengal for almost a week.When the tropical depression developed into a cyclonic storm, the IndiaMeteorological Department named the storm “Nargis,” a moniker takenfrom a list of names provided annually by each of the countries in thecyclone band of the Indian Ocean (contributed by Pakistan, nargis is anUrdu word for the flower narcissus, which is more commonly known asthe daffodil). By the time Nargis reached the coast of Burma, it had growninto a category four storm with wind speeds of up to 135 miles per hour.Cyclones of this magnitude can trigger a storm surge that would be highenough to engulf a two-story house. The storm charted a path across theIrrawaddy Delta, the vast flood basin for Burma’s main river that is populatedwith hundreds of farming and fishing villages, and directly throughRangoon, the country’s largest city and former capital, before finally dissipatingin the mountains along the Thailand-Burma border. With thehelp of regional and international weather-monitoring services, this muchwas known. What was not known was what had happened on the ground andwhat had become of all the millions of people who must have been inthe cyclone’s path. Over the following week, news began to trickle out from Burma, asgenerators were activated and electricity and phone lines were restored tosome parts of Rangoon. Photographs of the city looked as if they hadbeen taken in the aftermath of a massive explosion. Roads were blockedby fallen trees. Cars had been crushed by logs and telephone poles. Cementwalls had caved in and pavements were cracked open. The destructionin the city was catastrophic, but it soon became apparent that whathad happened in Rangoon was nothing compared to the devastation ofthe Irrawaddy Delta. Toward the end of the week, an e-mail from Burmacirculated some photographs taken in the delta; these were among theearliest harrowing glimpses of what had happened there. The first image was a picture of two dead girls. One girl wore shortsand a bright orange T-shirt printed with a cheerful floral pattern. Theother had on only a frilly pale green top. They lay on their backs in anest of sodden palm fronds with their eyes closed and their heads turnedaway from each other. They looked as if they had fallen, or been flung,from a very great height. The next photograph showed seven bodies floating in water, perhapsa pond. One grouping looked like it could be a family—a woman withtwo children on either side of her. The children were faceup with theirarms flung out, as if reaching for their mother. The other figures couldbe seen only in parts: an exposed chest, a red T-shirt, a billowing bluelongyi, or sarong, beneath which a pair of legs disappeared into the still,brown-gray surface of the water. The most gruesome photograph captured a row of bodies scatteredacross paddy fields. They were swollen and black from sun exposure.Rigor mortis had locked the bodies into crooked postures; their legs andarms were spread wide, and they lay entangled in grotesque and awkwardembraces. Within just a couple of days, the Burmese regime announced on statetelevision that as many as 10,000 people could have been killed. The verynext day, an official death toll was released that was more than doublethat figure with over 22,400 people declared dead and more than 41,000people missing. The majority of these lives were lost across the deltaregion, with Rangoon reporting only a few deaths. From these initial snatches of information, it was clear that CycloneNargis had been a disaster of epic proportions. In the delta, tens ofthousands of people were dead, and many hundreds of thousands musthave been trying to survive without food, water, or shelter. As the horrendousscale of the disaster became apparent, foreign governments offeredaid and assistance. Astoundingly, the Burmese government turnedthem down. In neighboring Thailand, the U.S. government had loaded a C-130cargo plane with lifesaving relief supplies that would have taken justunder an hour to reach Burma, but the craft was not given clearance toland at Rangoon’s airport. The United Nations World Food Programmehad three planes ready to fly in from Bangladesh, Thailand, and Dubaiin the United Arab Emirates. The planes were loaded with vitamin-fortifiedbiscuits for hungry survivors who may not have been able to eatfor some days and would be in need of instant nourishment. Thesebiscuit-laden planes were also denied clearance. A flight from Qatar carryingrelief materials and aid workers managed to land at Rangoon airportbut was immediately forced to take off again without unloading anyof its contents. As international emergency response mechanisms kicked into action,UN staff and aid workers experienced in disaster response were mobilizedfrom around the world. Few of them were granted visas to enterBurma. Many aid workers assembled in Bangkok, Thailand, a practicalstopover for processing entry visas. The Burmese embassy, however, wasclosed on the Monday after the cyclone for a Thai public holiday. Whena UN team of four experts was finally allowed to travel to Burma towardthe end of the week, two were sent back after landing in Rangoon despitehaving valid visas. In addition to preventing aid workers from entering, the regime wasalso restricting the movement of foreigners already inside the country.International aid agencies that had been working in Burma before thecyclone had switched into emergency mode, but their foreign staff was notallowed outside of Rangoon; only Burmese employees were able to travelto the delta to begin distributing supplies and look for ways to set up reliabledelivery routes. It is an established procedure in Burma that foreignaid workers at international nongovernmental organizations (NGOs)must apply for permits to travel outside of Rangoon (a process that cantake weeks, sometimes months); it was hoped that the authorities wouldexpedite travel requests after a natural disaster. Instead, they did just theopposite by slowing down the process and setting up checkpoints on exitroutes out of the city. Policemen were posted at the bridges and jettiesalong the Rangoon River where cars and ferries depart for the delta andprohibited foreigners from crossing over to the other side. Efforts were made to reason with Burma’s ruling generals through thehighest diplomatic channels. UN secretary-general Ban Ki-moon statedthat he had been trying to contact the country’s leader, Senior GeneralThan Shwe, to arrange a meeting; insiders at the UN said that the generalwas simply not returning Ban Ki-moon’s calls. George W. Bush, then thepresident of the United States, announced that the United States was willingto help and that U.S. Navy assets already present in the Southeast Asiaregion could be deployed to assist with search-and-rescue missions and aiddistributions; first, though, the Burmese generals would have to allow U.S.disaster assessment teams to enter the country. The French foreign minister,Bernard Kouchner, went so far as to invoke the “responsibility toprotect” principle, a UN proposal that would allow for the delivery of aidand assistance without the consent of the host government. The generals were impervious to these pleas and threats. On May 9,a week after Cyclone Nargis, a statement was released in which the Ministryof Foreign Affairs said that the country was “not yet ready to receivesearch-and-rescue teams as well as media teams from foreign countries.”According to the statement, the government was willing to accept provisionsbut would take charge of distributing them “by its own labors tothe affected areas.” Officials indicated that bilateral aid, assistance givengovernment to government, would be welcomed, but that meant placinga large amount of supplies directly into the hands of a rogue regime—asetup that was unacceptable for most Western donors, who require accountability,transparent procedures, and the ability to track the deliveryof the goods they donate. As if to further infuriate those who were trying to provide help, theregime announced its plans to go ahead with an upcoming nationalreferendum to vote on the newly drawn up constitution. Scheduled forMay 10, the referendum had already been dismissed as a sham by mostBurma experts. Having ruled the country for almost fifty years, the militarygovernment has established a well-earned reputation for being willingto do whatever it takes to stay in power, and the referendum seemedlike just another piece of trickery, a grand subterfuge designed to givethe appearance of democracy without actually delivering any greater freedomto the people. Indeed, the ruling generals have shown little interest in democracy andhuman rights. The regime’s current incarnation came into being after anationwide uprising against military rule in 1988, during which soldiersshot into the crowds and killed an estimated three thousand civilians. Inthe years that followed, the regime continued to quash any form of dissent.To this day, people perceived as a threat are imprisoned, and all criticismof the regime—be it spoken or written—is systematically silenced. Mostprominent among Burma’s political prisoners is the country’s iconic symbolof democratic values, Aung San Suu Kyi, who came to the fore duringthe demonstrations in 1988 and who has spent the majority of the interveningyears under house arrest.